52 Ancestors, No. 11: John C. Graham, and Celebrating My Family’s Irish Heritage | Photo Restorations by Tim G.
This photo didn’t really need a lot of work, but I gotta do what I gotta do to get a legit 52 Ancestors post up on here, and there is no better way to do that on St. Patrick’s Day than to honor John C. Graham, my great-great-grandfather along the paternal line. He is the Irish ancestor of my surnamesake. Although I’ll never hear his brogue, it still reverberates in the memory of my grandfather, who has done his best to help me preserve the family’s history. My Great Aunt Eileen identified the subjects: John C. Graham is seated at center right, with his wife, Anne (McShane) Graham seated at center left. 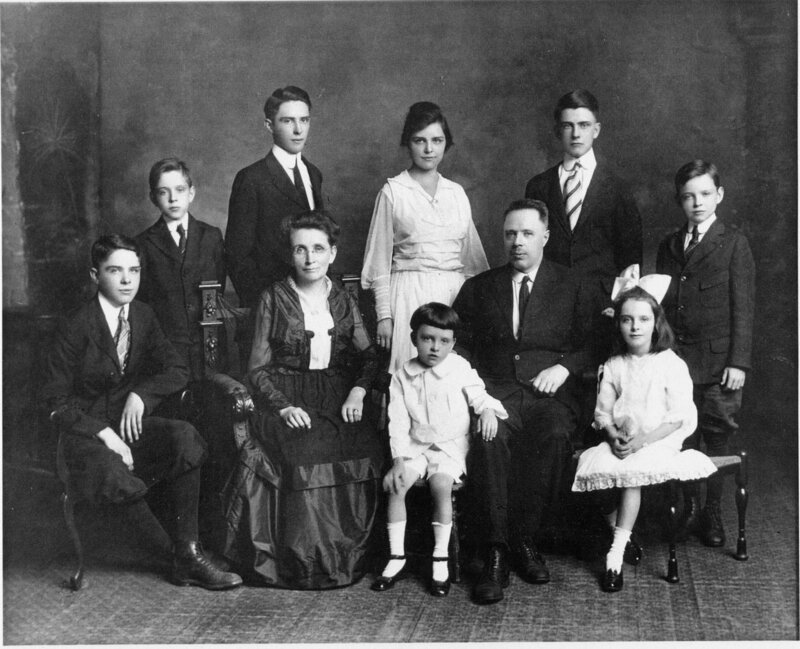 The children, clockwise from left, are my great-grandfather, Joseph A. Graham, in his awkward teen years, Thomas, Patrick, Genevieve (aka Reverend Mother Mary Bernard Graham, C.S.M. ), Frank, Edward, Katherine (aka Kitty), and James. Seeing this family photo from times gone by opened my imagination to what their lives might have been like. My grandfather’s story about how our line of Grahams came to Ireland from Scotland piqued my interest in actually discovering and hoarding family history documents. His story went like this: Throughout history the British had endeavored to impose Protestantism on the Scottish Catholics. The King managed to persuade one Graham Clan chief to convert his Catholic clan, but many clan members resisted. When the resistors were met with force, they returned force by kidnapping the Chief and executing him at an execution dock, that is, they tied him to a dock at low tide, and he drowned as the tide came in. The resistors shortly fled Scotland to avoid capture and retribution, and that is how our line of Grahams came to be in Ireland. 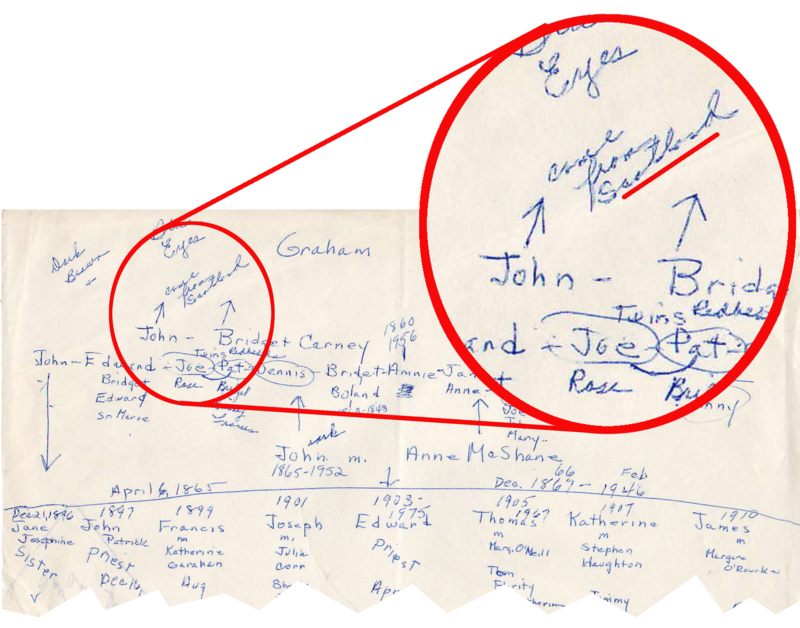 According to this handwritten tree, John C. Graham’s father “came from Scotland”. The story is missing one thing: documented evidence. I asked my grandfather how he came to know of this story. He told me that he had participated in a blood drive held at his place of business, the RCA Building in Camden, NJ. He said that the woman who took his blood was a protestant Graham. She told him the story, and that there was still an animosity against these rebel Grahams among the loyal Protestant Grahams who followed the orders of the chief. Unsatisfied with this level of documentation, I set about gathering family history records that might eventually lead back to the Scottish Grahams and the story of their arrival in Ireland. My Aunt Gail, who is a cousin of my father, was the first to assist me with a cache of documents that she had begun to gather for a family history school project in the mid 1970s. This consisted mostly of photocopied newspaper clippings, mass cards, and a couple of hand-drawn family trees. One of these trees purported that John C. Graham’s father, also a John Graham, “came from Scotland”. This tree, too, is unsourced but I understand that my grandfathers Aunt Kitty helped to assemble much of the information for that early project. The Clan Graham crest and tartan. Was John C. Graham’s father the Graham Chief Killer? I won’t believe it until I see it in writing. But I can believe that John C. Graham’s father came from Scotland, and if that’s true, then the Grahams were in Ireland for under a generation. In Scotland, the Clan Graham goes back at least to Sir William de Graham of the early 1100s, and perhaps earlier. The Clan Graham crest and tartan are at left. It’s motto, Ne Oublie, means Never Forget, and is a wonderful genealogical insipration. All told, I am a plurality of Irish, that is, I am more Irish than anything else, but not not quite half. My paternal grandfather is all Irish, including Scotch-Irish, like John C. Graham. My paternal grandmother is half Irish. Neither of my maternal grandparents are Irish at all, as far as I can tell (womp, womp). That makes me 3/8ths Irish, and that’s Irish enough to wish everyone a Happy St. Patrick’s Day (two days late)! As my family is more Irish than anything else, its Irish Catholic heritage appears most prominently among my family’s traditions. This includes my family’s Catholic faith, and strong identification with such Irish holidays as St. Patrick’s Day. My father keeps the Irish family heritage alive though his love of Irish music, which ranges from traditional to punk, and each tune has a story to tell about the history of the Irish people. Each February, my parents attend the Mid-Winter Scottish & Irish Music Festival, hosted in Valley Forge, PA by East of the Hebrides Entertainment. I’ve been to a few of these spectacles myself, and I highly recommend them to anyone yearning to reconnect with their Irish roots. For an example the voices of history coming alive through music in my home, consider The Rocky Road to Dublin, which was written by the 19th Century “Galway Poet” D. K. Gavan. The song describes the many travails that the protagonist encounters on this travels through Ireland of his time. The song has taken various forms as generation has embraced and re-interpreted it. Returning to John C. Graham, our Irish Ancestor on the paternal line, I can summarize his vitals thusly: He was born in Ballymena, County Antrim, on April 6, 1865. His father, also named John, may have been born in Scotland. Of his mother, I know only that she was named Bridget Kearney. County Antrim lies along the Northern Irish border. This has been an area of turmoil for centuries, so I’d be interested to know whether and in what capacity anyone in my family partook in any of the struggles that have often occurred there. He was born little over a decade after the Great Famine, so this is something his parents would have had to deal with. John had several brothers and sisters. Annie and Bridget were older, and Jane, Edward, Susan, Denis, Joseph, and Patrick were all younger. Along with John, Annie, Bridget, Edward, and Joseph all came to America during the 1890s. I believe that the descendants of Patrick, who stayed behind, now breed border collies on a farm near Portglenone. Of those who came to America, I believe that Bridget came first, and married a Michael Boland. John came shortly thereafter, and served as a witness to the naturalizations of his younger brothers. As I had mentioned in an earlier post, most of my Irish ancestors on the Graham side were either saloon keepers or in the clergy. John was a saloon keeper. He married Anne J. McShane on the 17th of June, 1896, and began to build the family that I have shown above. Several members of which should receive write-ups before the year is through. John outlived his wife, Anne, who died in 1946, and his son, my great-grandfather, Joseph, who died in 1948. 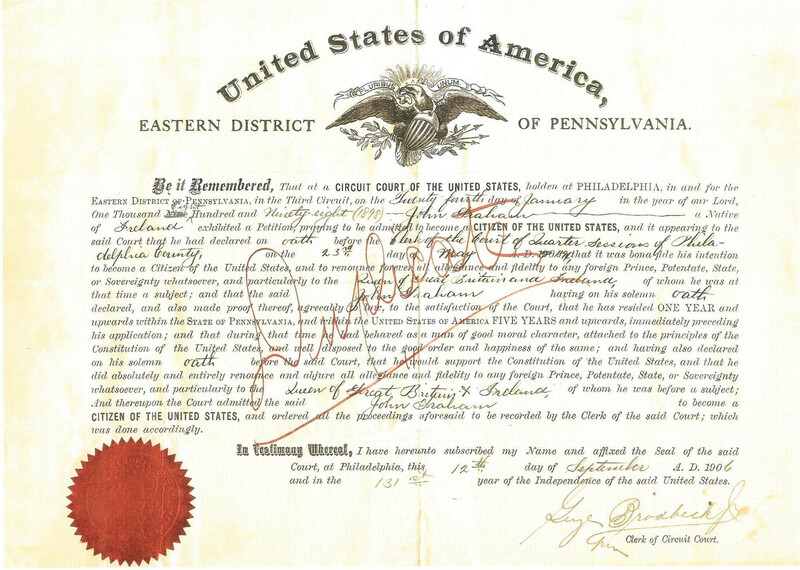 He died himself on June 2nd, 1952 and was buried at Holy Sepulchre Cemetery in Cheltenham Township. 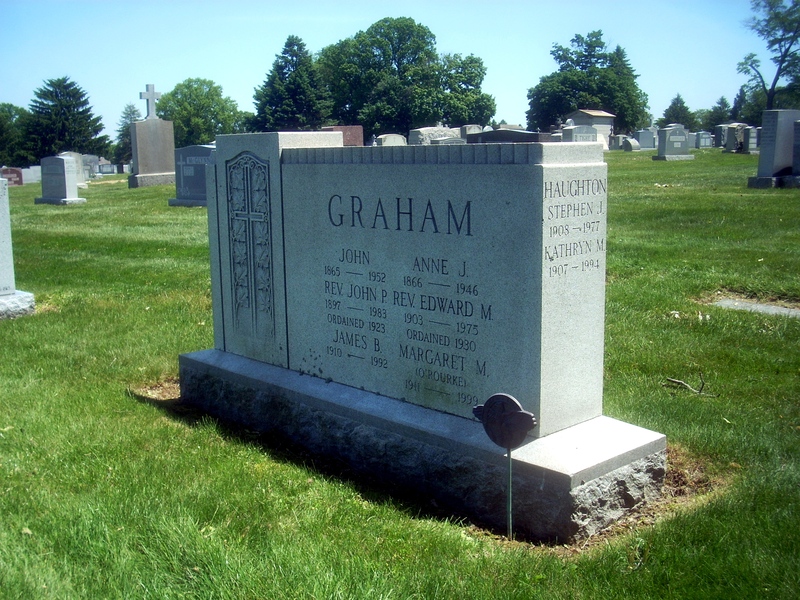 The final resting place of John C. Graham, and several of his children. Sláinte! Happy (belated) St. Patrick’s Day to all, and may the road rise up to meet you! Special thanks to my grandfather, Joseph, my Aunt Gail and cousin Andee (who are sisters), and my Great Aunt Eileen for their contributions to this story. The image of the Graham tartan and crest is from CafePress.com. 52 Ancestors, No. 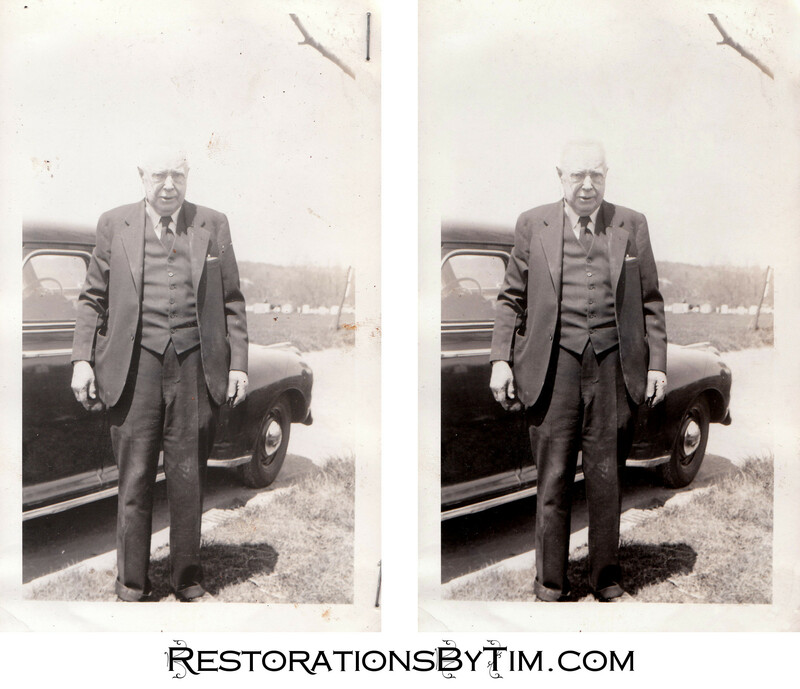 25: Denis Graham, a Link to the Past | Photo Restorations by Tim G.